Dental pain is usually associated with some form of nerve injury. 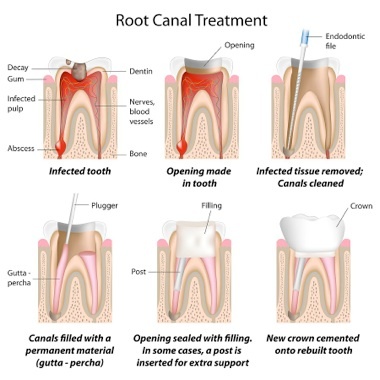 Root Canal Therapy is the best alternative to extracting a tooth when the pulp (or nerve) is damaged (usually due to decay, trauma or fracture). In this process, the pulp is removed and replaced with a plastic type material. 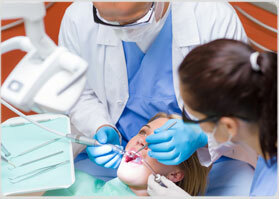 This process usually prevents the tooth from developing an infection and permits retention of the tooth. The procedure is initiated after local anesthesia is administered to the affected site. Dr. Grant then utilizes tiny rotary instruments to remove the injured soft tissue from within the tooth and sterilizes the area. After the canals are sealed the tooth is ready to be restored to its proper form. Modern technology now allows this procedure to be completed in a short period of time, usually in one short appointment. Recent breakthroughs in adhesives, combined with the development of stronger porcelain materials, allow us to make crowns entirely out of porcelain. All-porcelain crowns maintain a translucency that makes them hard to tell from natural teeth. Without metal, the problem of a dark line at the edge of the gums is eliminated. This allows us to place the edge of the crown above the gum line, and that's healthier for your tooth and gums. When you want to improve your smile, all-porcelain crowns are a beautiful and natural looking choice.